Gabby and Steven met through a mutual friend and after 7 months together they knew they were perfect for each other, and got married at their local courthouse. They knew they wanted to host a ceremony somewhere along the water, but their initial inquiries into Michigan venues and on cruise ships were not what they had envisioned. That’s when Gabby’s dad suggested a destination wedding, and they began to look into Caribbean destinations. Gabby began her research online and one of the first sites she found was Destify, and was quickly paired with her agent Brittany. After seeing several options they chose the Sunscape Sabor Cozumel resort in Mexico. 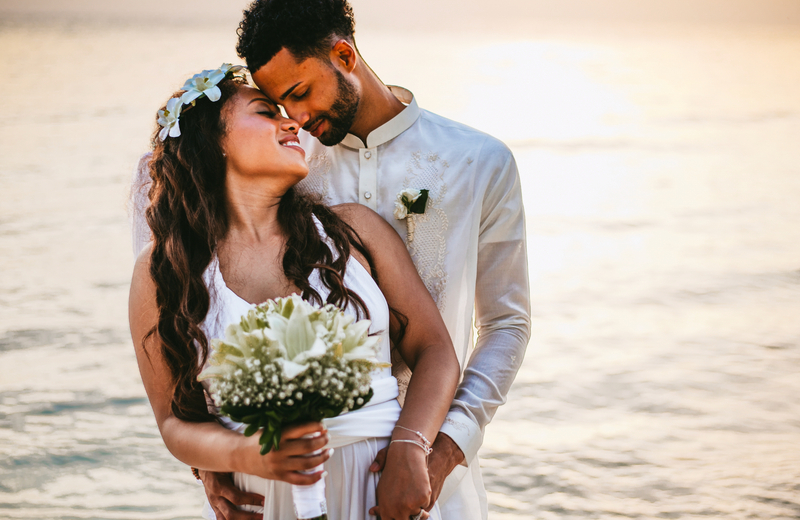 Hosting a destination wedding proved to be ideal when it came to the invitation process, Gabby said, “You could invite everyone, it was up to them if they could make it, and no one’s feelings got hurt”. The planning process was a bit nerve-wracking. Gabby admits it was hard to envision all of her choices coming together, from flowers to the venues since she wasn’t there in person. Her wedding coordinator at Sunscape, Patty, was always responsive to her questions, but due to “island time” there was a waiting period of a few days involved between emails. Once on-site everything came together after an in-person meeting. The couple skipped a rehearsal dinner as many of their guests arrived at different times. After researching photographers Gabby and Steven chose an outside vendor, and although there was an additional charge they were happy to have a professional who fit their desired aesthetic. The vendor even utilized a flying drone camera to capture the wedding festivities at some points! She spent the wedding day enjoying the resort and getting ready with her mom, and her cousin who did her hair. Since the destination wedding process focuses on the decor and design just months before the wedding, Gabby admitted she was anxious up until the ceremony. But looking back she says to trust the process, the wedding department knows what they’re doing. The couple also recommends looking into outside vendors, it’s worth the extra charge to meet your vision for your wedding. Once I was walking down the aisle, it all made sense. Everything was perfect.